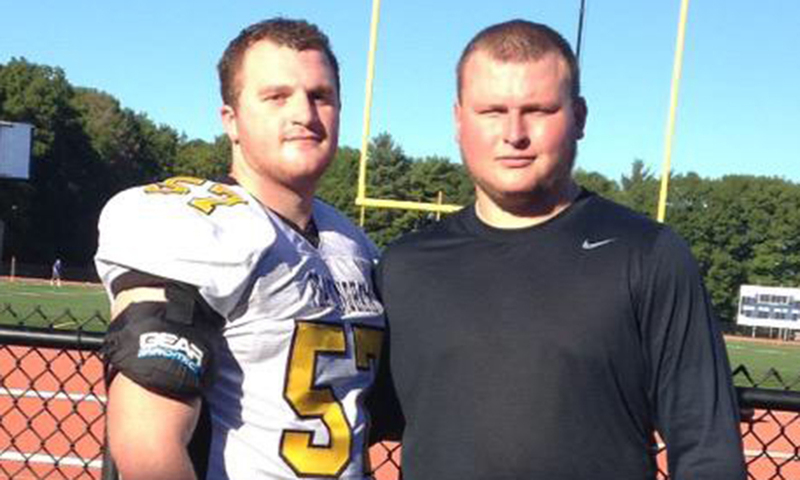 It was a matchup of friends and former teammates over the weekend as Framingham State’s Joey Wilder and Westfield State’s Pat Raeke started on opposite sides of the ball. Both members of the Class of 2014 at Stoughton High, Wilder starts at left tackle on the Rams’ offensive line and Raeke starts as a defensive tackle for Owls. Raeke was able to record his second sack of the season but it was Wilder and Framingham that walked away with a 35-7 win for their fifth victory of the year. King Philip graduate and current Bentley junior Sam McDonald was tabbed as the Northeast-10 Conference Player of the Week. McDonald had two interceptions in the victory, along with four tackles. His first pick set up a go-ahead touchdown for the Falcons in the second quarter and his second locked up the win with 17 seconds left. McDonald now has 12 career interceptions, which is the most for any NCAA D2 junior in the national and is ninth in program history. One week ago, Bridgewater State’s Carlton Williamson won the MASCAC Play of the Week for his kick return for a touchdown. Now his 35 yard touchdown run is in the running again this week. The OA alum had 20 carries for 94 yards while KP alum Michael Viola hauled in one pass for 28 yards. Meanwhile, Cameron Williamson had four tackles, including one for a loss, and an interception and 34 yard return. Canton’s Anthony LaRose was strong for UMass Dartmouth in the loss with eight tackles, a pair of tackles and three total tackles for loss while Mansfield David Collins also had eight tackles. North Attleboro grad Alex Jette continued his stellar start to his sophomore season with one of his best performances in his career. In Brown’s 25-24 win over Holy Cross, Jette hauled in 16 passes (ninth most in program history for a single game) for 216 yards. He ranks fourth nationally in the FCS in receptions per game (8.5) and eighth in in receiving yards per game (111.5). Jette was named the Brown Student-Athlete of the Week. Castleton’s George Busharis had an efficient day under center, going 19-26 for 184 yards and a touchdown in the team’s 34-14 win over Mount Ida. The former Mansfield standout tossed a 20 yard touchdown in the third quarter. Fellow Mansfield alum James Comer had seven tackles for Mount Idea with one going for a loss of three yards. Foxboro’s Tyler Spancer had a team-high five catches for Fitchburg State over the weekend while Taunton’s Asante Eater notched nine tackles and had a fumble recovery and an interception and return of 63 yards. Mansfield graduate Aurian Dawkins had three tackles in the loss for Worcester State. WPI football bounced back from its lone two losses of the season with a close win over Union this weekend. Unsurprisingly, it was a pair of Hockomock alums that guided the way on offense. Stoughton graduate Dan Eckler was 17-33 with 155 yards, rushed for 95 yards on 14 carries and a touchdown and threw for two touchdowns. 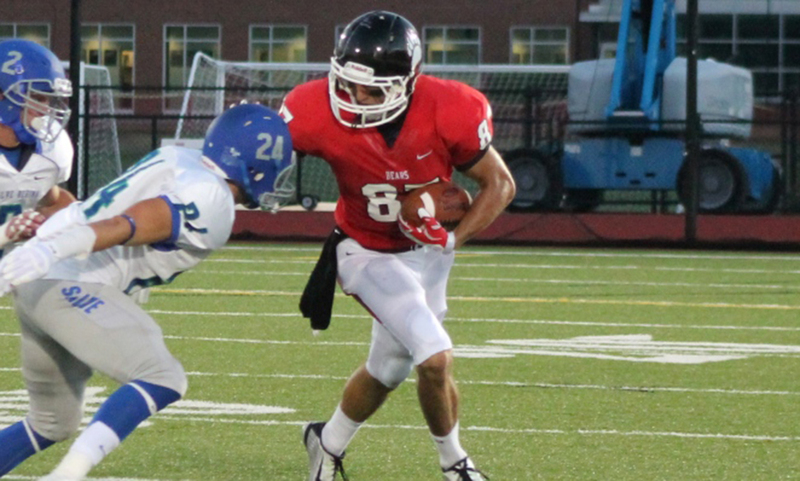 Both of Eckler’s touchdown passes went to Franklin graduate Brandon Eccher, who hauled in seven catches for 80 yards. Eckler also linked up with former high school teammate Marcus Middleton, who had three catches for 40 yards. Canton grad Scott Levy scored his third goal of the season in the 25th minute of Bentley’s 2-1 victory over Southern Connecticut on Tuesday. He also had a pair of assists on Saturday in the Falcons’ 2-1 win against Le Moyne. Bentley has won three in a row and Levy is second on the team with three goals and tied for first on the team with four assists and 10 points. Josh Ocel of North Attleboro, a junior midfielder at Brandeis, was named the University Athletic Association Player of the Week for men’s soccer last week. Ocel recorded his second career two-assist game in a 2-1 win against Case Western Reserve (both off corner kicks). His seven assists this season are tied for first in the UAA and in the top 40 across Div. III. He leads the Judges (10-1-1) in scoring and his assist against Mass. Maritime moved him into the school’s top 25 all-time. Attleboro’s Dominik Machado notched his second goal of the season for Providence College in a 3-0 win over No. 24 Xavier, which was the first Big East win and first win over a ranked opponent this season for the Friars (5-4-1). A trio of former Stoughton players are leading Massasoit women’s soccer towards a New England Championship game appearance. Shelby Sprague scored a pair of goals on Monday in an 8-0 win against Monroe College JV and her former teammates Courtney Wagner added a pair of assists and Emily Morgan made her ninth start in 10 games played in the Massasoit defense. Massasoit is poised for a return to the title game to face Holyoke Community College. Another former Stoughton player, Alicia Macomber, scored a goal in Worcester State’s 3-0 win over MCLA on Saturday. Macomber, the reigning conference player of the year, also scored in a 2-1 overtime loss to Keene State three days earlier. She is tied for the team lead with five goals and leads the Lancers with 11 points. Canton grad Kim McNally scored her first career goal for Sacred Heart in a 3-2 loss to Robert Morris last Friday. McNally hit a first time shot off a corner kick into the top corner to tie the game at 2-2. A sophomore defender, McNally has played in all 13 games this season and started 11. Sharon grad Meg James has started all 13 games in defense for the University of Vermont, making it 48 straight starts for the former Eagle. James was named to the America East Honor Roll last year and has helped the Catamounts to a 6-5-2 start and 3-1-1 in the league, which is the program’s best start in the America East since 2001. Alicia Wilde recorded 14 kills to lead Babson to a five-set win over Emerson on Tuesday. The Beavers rallied from two sets down to get the win, which was the 100th for head coach Eric Neely (brother to Franklin boys’ basketball coach C.J. Neely). On Saturday, Wilde had nine kills and three blocks as the Beavers beat Colby-Sawyer in four sets. She is second on the team with 164 kills on the season. Julia Murphy led UMass Boston with 10 kills and .474 hitting percentage in a three-set win over Southern Maine. The former Canton player added 12 kills and three blocks in a win against Plymouth State. The junior middle hitter is second on the team with 145 kills and leads with 25 blocks. Melissa Daigle was named the NEWMAC Volleyball Player of the Week, becoming the first WPI player to earn that honor since 2010. Daigle totaled 59 kills in a 4-0 week for the Engineers, including a five-set win over Babson. The sophomore from King Philip had highs of 18 kills against Babson and 17 against Smith and added 20 digs and six blocks this week. Daigle is second on the team with 175 kills to help WPI to a 15-5 record. Freshman Chidera Nwankwo recorded 19 kills on Tuesday with a program-best .760 hitting percentage to help Suffolk University beat Pine Manor in four sets, The middle hitter from Canton recorded the most kills by a Suffolk player in more than two years. Nwankwo is the team-leader with 122 kills this season. Salve Regina field hockey tied a program record with its eighth straight win on Tuesday, The Seahawks are led by former Foxboro player Abby Tepper, who scored her 20th goal of the season in Tuesday’s win against Bridgewater State. That breaks the program’s single-season record for goals, which Tepper set last season when she totaled 19. Lindsey Venuto, also of Foxboro, added a goal for the Seahwaks, her sixth of the season. On Monday, Tepper was also named the CCC Offensive Player of the Week for the third straight week. She scored four goals and had two assist in a pair of conference wins and became Salve Regina’s all-time leading scorer in a shutout of Western New England. She is third in the country in Div. III for goals per game at 1.58. Another former Warrior scored her second goal of the season for MIT to help the Engineers to a 5-0 win over Clark University. Sophomore Katie Notarangelo had her one-timer from a corner deflected by a defender’s stick into the back of the net for what turned out to be the game-winner. Madeline Hoffman of Mansfield scored a pair of goals, including the game-winner in overtime to lead Fitchburg State to a 3-2 win at Framingham State. The junior hit a one-timer off a corner to give the Falcons the win. Hoffman is tied for second on the team with four goals this season. The UMass Dartmouth field hockey team has won its last two games and several former Hockomock players have contributed. Sophomore goalie Allison Burke of Franklin made one big save to preserve a 2-1 win over Westfield State and two saves in the shutout of Framingham State. In the 6-0 win over the Rams, junior Katelin Morrissey (Taunton) and Allie Kane (Attleboro) each scored goals. Morrissey also led the team with five shots in the game. Chestnut Hill College golf won the Griffin Invitational for the second time in as many years on Tuesday, Canton alum Sam Riemer shared the lead with the low round of 70. The sophomore was one of the reasons that Chestnut Hill pulled out a 16-stroke win. Riemer shot a 159 over two days of the Revolutionary Collegiate Classic, including an eagle in the final round. Chestnut Hill came from behind to win the tournament by six strokes. Oliver Ames grad Nick Carter shot a season low 71 on Saturday to help St. Anselm golf take 10th place in the Saint Rose Shootout in Albany, N.Y. The sophomore matched the low round of the season for the Hawks. Over the weekend, North Attleboro senior Connor Flynn hauled in a one handed diving touchdown catch and one fan remarked he hadn’t seen anything like that since Alex Jette was a Rocketeer. 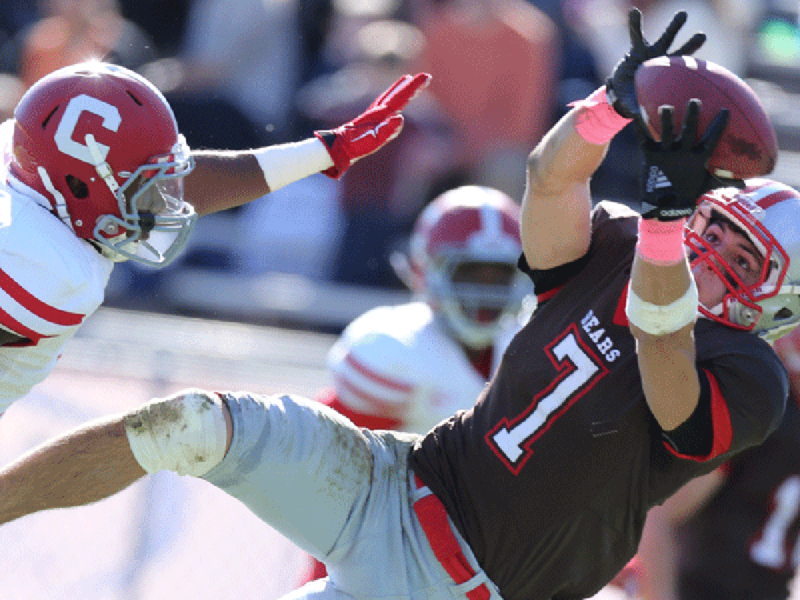 It was only fitting as Jette was busy making plays in Brown University’s 41-31 win over URI. 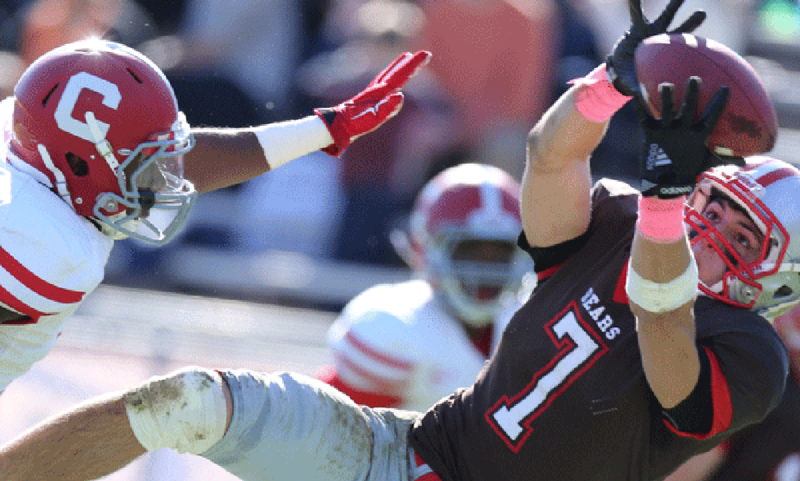 Jette scored twice, the first an 11-yard reception in the first quarter and the second a 20-yard pass in the fourth quarter that put Brown ahead for good. With Bentley trailing 13-12 with about one minute left in the third, North Attleboro senior defensive end Paul Norris recovered a fumble on the Pace 46. The Falcons went on to hit a field goal and won the game 15-13. Norris also had seven tackles in the game. Attleboro’s Chris Walsh was the only person to get a reception for Bentley, catching one pass for seven yards. Attleboro’s Teagan Tirabassi started his third straight game on the offensive line for Plymouth State over the weekend. Tirabassi and Plymouth State were able to edge Westfield State 20-19. The Owls had a pair of former Hock stars starting on their offensive line too as Mansfield’s Andrew Horstmann started at right guard and KP alum Pat Lydon lined up next to him at right tackle. Foxboro’s Alton George started on defense for Plymouth State and Stoughton’s Pat Raeke and Mansfield’s Nick Borsari both started at defensive tackle for Westfield. Oliver Ames’ Carlton Williamson had a big day in Bridgewater State’s win over Western Connecticut. Williamson rushed for 97 yards on 23 carries, including a 32-yard touchdown run. He also had two receptions for 31 yards and then punctuated his performance with a 77-yard kickoff return. Younger brother Cameron had seven tackles, KP grad Michael Viola had two catches for 34 yards and Taunton’s Devi DeCourcey had a half tackle for a loss. Foxboro’s Ty Spencer inched closer to Fitchburg’s career touchdown reception by hauling in a 13-yard touchdown in the Falcons’ 36-7 win over Mass. Maritime. Spencer hauled in eight total passes for 67 yards in the win. Taunton’s Asante Easter made four tackles for the Falcons while Mansfield’s Alex Ruddy had four tackles for Mass. Maritime. Attleboro grad Tommy Burns had four tackles, including one for a loss, and a pass breakup in Framingham State’s 26-14 win over UMass Dartmouth. For UMD, Canton’s Anthony LaRose and Mansfield’s Lou Petrella each blocked a kick while Taunton’s Marcel Flynn had three tackles. Western New England picked up a big 49-6 win over Nichols over the weekend. Oliver Ames alum Dean Soucie had seven tackles, including a sack and another half tackle for loss. Despite the loss, Attleboro grad Brenden Massey had his best game of his young career with five catches for a team-high 50 yards. On defense, KP alum Brett McEvoy had three tackles for the Bison. Dean has had a great start and its 9-0 record has earned them the #18 ranking in the NJCAA Division I Mens’s Soccer Rankings. North Attleboro grad Justin Freitas has netted 13 goals in his freshman year, which is tied for 14th overall in NJCAA DI. His 32 points are tied for 16th best in the nation. Freitas played the majority of his high school career with the New England Revolution Academy but did don a Rocketeer uniform before the Academy’s rule change. Attleboro grad Kyle Lameiras has also been a big help for the Bulldogs, having started in all eight of the teams games while playing defense and has two assists. Josh Ocel continues to be a spark for the nationally ranked Judges of Brandeis University. Ocel scored a goal and added an assist in a 4-2 win over Carnegie Mellon, which was the most goals that the Judges had scored in a league game since 2002. Ocel leads the Judges with eight points (two goals, four assists) this season. King Philip’s Andrew Allen has appeared in five games so far this season during his freshman campaign. Stoughton graduate Shelby Sprague has been putting on a clinic for Massasoit so far this season. The freshman has scored 21 goals this season, which is second in the entire nation for NJCAA DIII. Her 44 points put her third in the nation. Sprague netted her fourth hat trick of the season on Monday in a 7-0 win over Springfield Technical Community College. Sprague has won the NSCAA National Player of the Week twice this season. Mansfield’s Kelsey Kiely has been on a roll as of late for the Bridgewater State Bears. Kiely, who has appeared in nine games this season, has scored all four of her goals in the last three games. In a 6-3 win over Framingham State, Kiely netted a pair of goals. She had a goal and an assist against Anna Maria and then scored against in a win over Fitchburg State. Mansfield’s Janet Maher is just one of four players that has started in all 10 of BSU’s games so far this year.